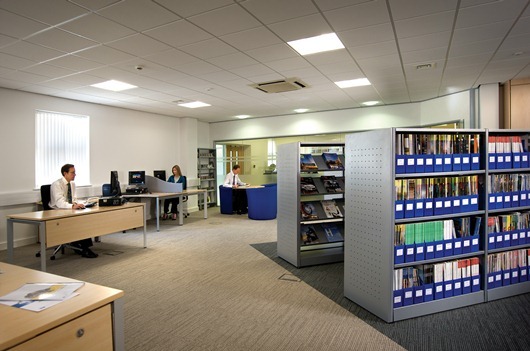 Following extensive refurbishment and rebuilding work, the world renowned Ricardo library has re-opened in its prime new location adjacent to the reception area of the company’s Shoreham Technical Centre headquarters, underscoring the importance of effective knowledge management to the organization. The Ricardo library provides arguably the largest and best maintained independent collection of automotive engineering knowledge and information worldwide. This fully managed collection is maintained by the company’s team of professional librarians, and incorporates a wide range of public domain references from all aspects of vehicle and powertrain engineering, including from many foreign language sources. In addition to providing an invaluable resource to the company’s in-house engineering and research teams for more than forty years, the Ricardo library also provides a range of services to external customers on a commercial basis. The new, purpose-designed library incorporates a modern layout with a number of ‘hot desks’ and computers for on-line searches, compact shelving for hard-copy literature and improved displays for periodicals. The facility is linked to the reception building and demonstration and display area that was itself formally opened in 2008 by HRH The Duke of York. In parallel with its move to this new location, most customers of the Ricardo library will continue to enjoy the benefits of its services on-line through the ‘Powerlink’ database of the library’s entire collection, the global emissions legislation database EMLEG, and the many specialist reference publications produced by the library team on a regular basis.